The woodchuck (Marmota monax), a member of the squirrel family, is common throughout Indiana. It can be found in open pastures, woodlots, cultivated and fallow fields, and along railroad embankments, ditch banks, roadsides, fence rows, and levees. In cropping areas, woodchucks consume soybeans, corn and alfalfa. The extensive burrowing activities of woodchucks in fields can interfere with farm operations, cause damage to equipment, injury to livestock, and create significant erosion problems in levees, pond dams and railroad embankments. Around private homes, one or two woodchucks are capable of ruining a small garden almost overnight. Woodchucks should not be viewed as pests only, however; their burrows often provide refuge for other wildlife such as rabbits, opossums, raccoons, skunks, foxes, and even some game birds. They also contribute to the aeration and mixing of the soil through their burrowing activities. Moreover, many people derive enjoyment from watching these rodents since they are one of the few large wild mammals commonly seen during the day. 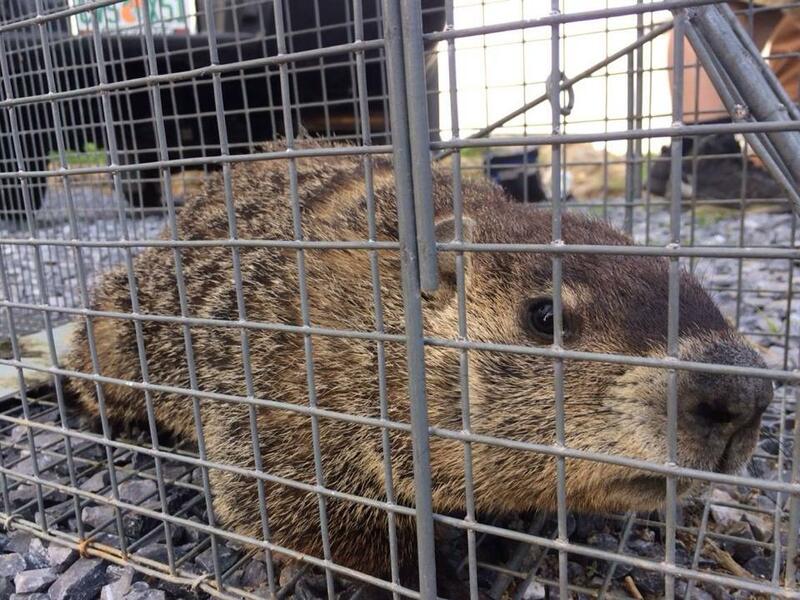 Thus, woodchucks are an interesting part of our wildlife and should be controlled only when they become troublesome. The woodchuck is a vegetarian. Various grasses, clover, alfalfa, plantain, and other types of tender green succulents make up its diet. In crop areas, it is especially fond of the soybean plant, but it will also feed on young corn plants and even ears in the milk stage. An adult woodchuck consumes between 1 and 1-1/2 pounds of vegetation daily. The greater part of a woodchuck’s day is spent in the burrow presumably sleeping. Feeding periods vary according to weather conditions and the season. During the cool days of early spring, it is most active during the warmer parts of the morning and afternoon. However, during the summer, the warmest parts of the day are spent in the cool burrow and feeding occurs during the very early morning and again at dusk. Woodchucks are least active on cool, rainy days. 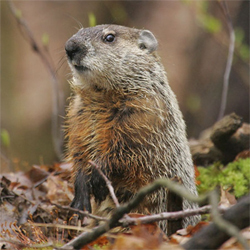 Woodchucks enter hibernation beginning mid-October and emerge during February. They mate shortly after emergence, with a single litter of four to six young born a month later (March-April). The young leave the nest in early July to establish their own burrows and territories. Woodchucks live an average of 4-6 years. 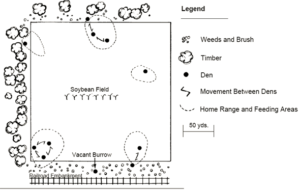 An understanding of burrow construction and of the movement of woodchucks within and around crop fields is important for effective control programs. Too often, only temporary control is achieved because the number of active burrows and/or the number of woodchucks within a field and its surrounding area is underestimated. Woodchucks usually construct two types of dens: winter dens and summer dens. Winter dens are often located within wooded or brushy areas and serve as hibernation chambers, although occasionally they are used year round. These dens have only one opening, with the hibernation chamber situated below a tree or stump for protection against intruders. The winter den is abandoned by the woodchucks several weeks after they emerge from hibernation. The animals then move into nearby grassy meadows or crop fields and construct their summer dens. Soybean, clover, alfalfa, and corn fields are particularly favored for summer den locations. Summer dens contain between one and five openings, but typically there is one main entrance and one or more escape or “plunge” holes. The plunge holes are often well concealed among vegetation and may even be plugged. If a den has been in use for several years or by several generations of woodchucks, the burrow system may be complex, lengthy and contain several openings. It should also be noted that adult woodchucks often construct more than one summer burrow system within a field. Thus, there are auxiliary burrows as well as main or “home” burrows. Because the auxiliary burrows are used for refuge to escape danger during the animals’ daily foraging activities, there may be constant back and forth movement between dens during the summer. The average burrow system is located about 2-4 feet underground and extends horizontally 15-25 feet (or more) (Figure 1). The main nest chamber is generally located at the end of the burrow system, but additional nests may be constructed in any part of the burrow. The main entrance to the burrow is characterized by a mound of fresh earth around the opening as well as by numerous trails leading to the feeding areas and auxiliary burrow systems. When other animals such as rabbits, skunks, foxes, or badgers are using woodchuck burrows, the fresh earth mound is absent at the entrance. Also, various types of animal remains and feces are often found around the entrances to dens used by skunks, foxes and badgers. Fig. 1. Diagram of a typical woodchuck burrow. The daily home range of woodchucks varies considerably. In favorable habitats, such as a soybean field, woodchucks may forage only 20-30 yards from their home dens. In less favorable habitats, such as woodlots, road edges, yards, etc., the woodchuck may travel several hundred yards daily to reach feeding areas. Generally, only one or two adult woodchucks will inhabit one acre, although occasionally there may be more. Woodchucks are territorial and defend their dens against other woodchucks except during the breeding season when the adult male and female will occupy the same den. Control efforts should be carried out during early spring when active burrows are easy to find, the young woodchucks have not yet scattered, and there is less likelihood of harming other wildlife. Woodchucks are most practically controlled in crop fields via fumigation of their dens or by shooting. Around buildings or high fire hazard areas, or where it is desirable to control the woodchucks with a nonlethal approach, live-trapping is the safest and most appropriate means. If the woodchuck population is large, it is important that control programs be systematic and encompass the affected field and areas surrounding the field (Figure 2). Particular attention should be given to well drained protected areas, wooded crop borders and weedy fence rows. All active burrows should be flagged to aid in rechecking and retreating later. If the affected area includes adjoining farms, cooperation should be sought from the neighboring farmers. Without a thorough program and cooperation among land owners, long-term control results are likely to be poor because exterminated woodchucks will be replaced by invading individuals from surrounding areas. Fig. 2. 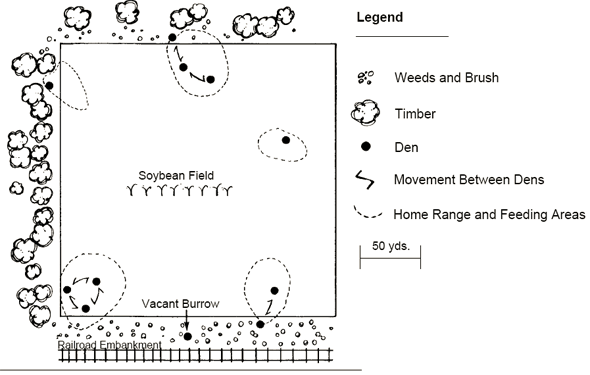 A two acre area of a soybean field during mid-summer with woodchuck den locations, movement between dens, home ranges, and feeding areas noted. Fumigating woodchuck burrows is accomplished using gas cartridges. When ignited, these cartridges release carbon monoxide into the burrow system, killing the woodchuck. Gas cartridges are available from local farm supply stores and some county Extension offices. Locate the main burrow opening (identified by mound of fresh excavated soil) and all other secondary entrances associated with the burrow system. With a spade, cut a clump of sod slightly larger than each opening. Place the sod near each entrance. To prepare the gas cartridge for ignition, follow the written instructions on the label. Kneel at the burrow opening, light the fuse, and immediately place (do not throw) the cartridge as far down the hole as possible. Gas cartridges are not bombs and will not explode. A long stick can be used to aid in pushing the cartridge deep into the burrow. Stand by for 3-4 minutes and watch burrow holes. Seal those from which smoke is escaping. If holes nearby the main entrance do not exhibit smoke following treatment, these burrows should also be treated. Repeat these steps until all burrow systems have been treated in and around problem areas. Caution should be taken to avoid prolonged breathing of gas cartridge smoke. Also, since sparks may be thrown, gas cartridges should not be used near buildings or any combustible materials. For best results, burrows should be treated on cool, rainy days or during periods of inactivity on other days. Because vacant burrows may be reoccupied by individuals from adjoining areas, all fumigated burrows should be rechecked weekly for one month. Any reoccupied burrows should be retreated. Fumigation should not be done after September since most woodchucks will be in hibernation and the hibernating chamber is often “walled off,” rendering a fumigation treatment ineffective. It is easy to live-trap woodchucks from around buildings or directly outside their dens in crop fields using either the Tomahawk No. 108, 108.5, 608, 608.5, or the Havahart Nos. 3, 3A or 1079. Set the live trap in the trail immediately in front of the main burrow entrance (Figure 3). Logs, twigs, or stones placed on either side of the path between the burrow opening and the trap will aid in funneling the animal toward the trap. If a double door trap model is used, set both doors of the trap open. Good baits for woodchucks include apple slices, carrots, sweet corn, and fresh lettuce. Fig. 3. Wiremesh live trap. Woodchucks can be encouraged to enter live traps by providing a natural footing of earth on the bottom of the trap. To do this, push the trap back and forth on the ground to work the bottom of the trap into the earth. Lay out a trail of 2-3 small pieces of food spaced about five feet apart, leading directly into the trap. This will encourage the woodchuck to eat his way directly into the live trap. Place the majority of the bait inside the trap beyond the trap trigger. Prior to setting your live traps, set and spring each trap a couple of times to ensure the trap mechanism is functioning properly. To minimize stress and injury to trapped animals, check traps mid-morning and again before dusk. Traps containing animals should be covered with an old blanket or covered in some other way. Trapped animals tend to remain calm when kept in darkness. Should potentially dangerous animals such as feral cats or dogs be caught in the traps, they should be brought to the local humane society or animal shelter for proper handling, or consult these organizations for the most humane method of disposal or handling. Any non-target wildlife (e.g., local pets, birds, etc.) inadvertently captured should be set free immediately. Never, ever attempt to pet, handle or harass any captured woodchuck as some can be vicious biters and posses extremely sharp teeth and powerful claws. Captured woodchucks should be relocated at least 5 miles from the trap site and released in an area where they will not cause a problem for someone else. Live traps may be rented from local humane societies and animal shelters. They can also be purchased from those companies listed at the end of this publication. However, such traps are relatively expensive and their purchase is hard to justify unless woodchucks, and other similar-sized animals (e.g., raccoons, opossums, rabbits, squirrels) pose a regular nuisance to the property owner. Where legal and safe, the quickest and surest method of eliminating woodchucks is to shoot them with a “varmint rifle” (e.g., scope sighted .243 caliber). A patient marksman can significantly reduce a local woodchuck population in a few days. Hunt during periods of greatest activity on fairweather days.